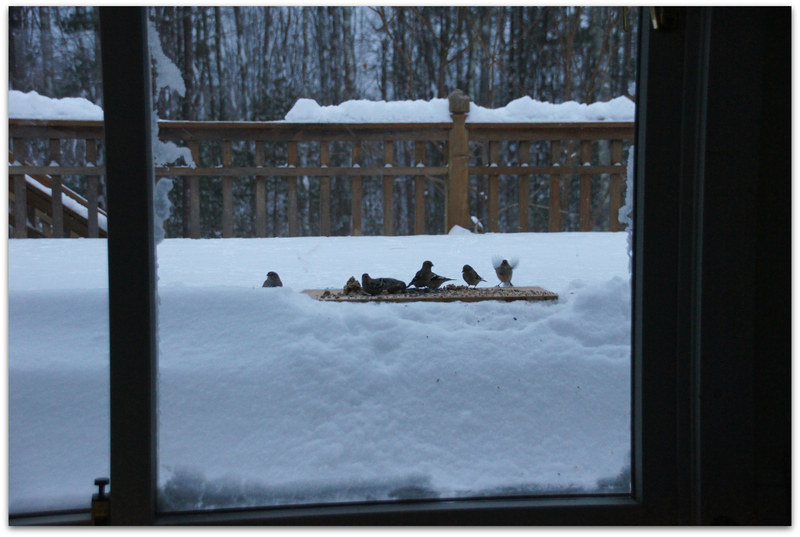 If you have been feeding the birds in winter, you’d better keep feeding them… even in a blizzard. Especially in a blizzard. Yesterday morning we woke to a fresh 18 inches and it was still snowing. Birds arrive half an hour before dawn, needing fuel after a cold, cold night, but I didn’t want to put on all my outdoor clothes and boots and shovel my way to the feeders yet… it was Sunday morning, after all. So I found a piece of plywood and put it down on the snow on the back deck and tossed some mixed seed on there. Juncos and goldfinches, tree sparrows, chickadees and titmice were happy campers. Cardinals too. A blue jay or two. Doves. 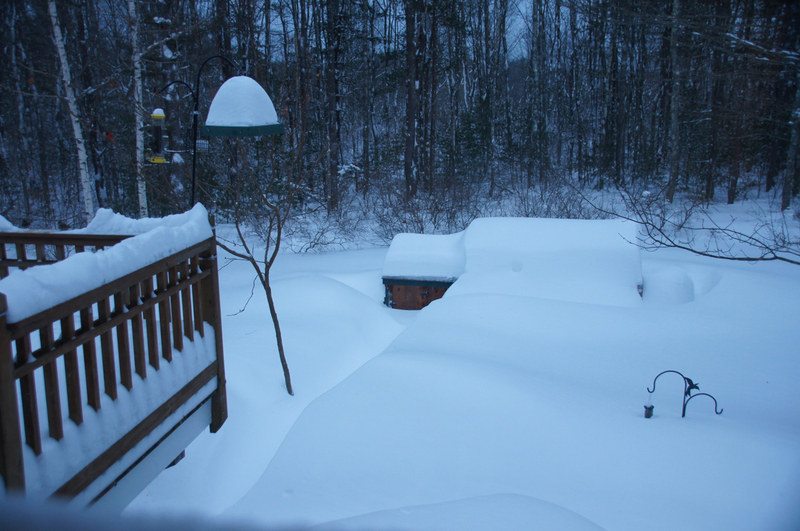 A little later I shoveled paths to the feeders and filled them. Not to mention the chicken coop! Lots of shoveling. 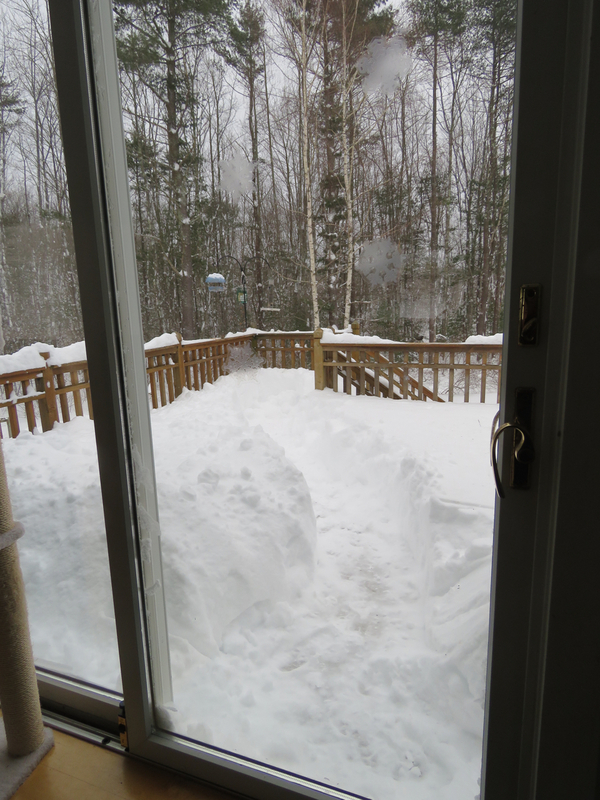 The coop and chicken run are bermed with snow and half underground, like a cozy hobbit hole. There is plenty of straw in there for insulation. I check on food and water two or three times a day, plus pay my hens a little visit. Two brown eggs yesterday. I had a blue-green egg and a couple more brown ones. I made a bacon and asparagus quiche yesterday morning for brunch. Lots of Black-capped Chickadees around the last few days, more than usual. Maybe there is less of whatever they eat out in the woods. Or it’s harder to get to. One day a few weeks ago I watched a chickadee hopping around on the branches and trunk of a red maple tree, nibbling at something tiny and invisible, making happy little sounds to itself. I wondered if it was tiny bits of maple sugar oozing from the pores of the tree. A little sweetness in bitter winter. 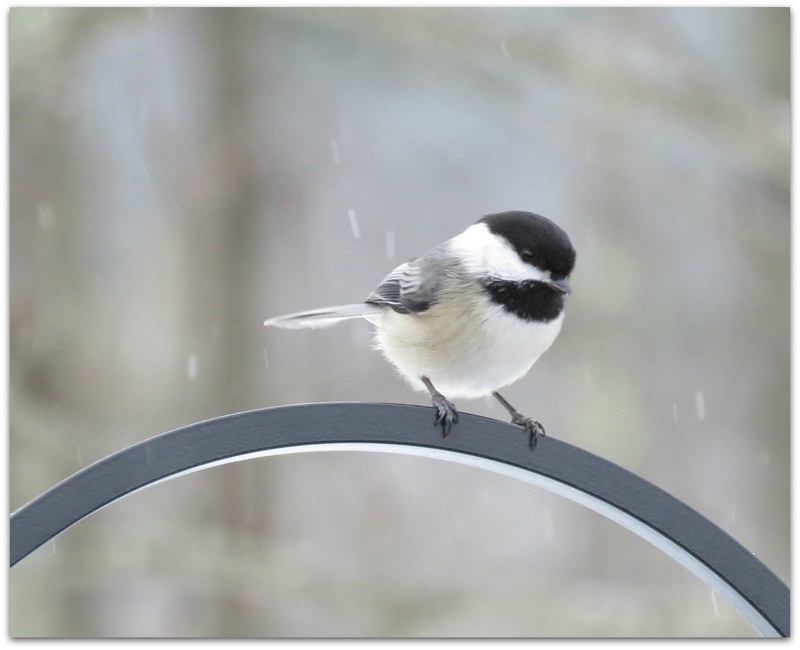 This entry was posted in Uncategorized and tagged birds, Black-capped Chickadee, feeding birds, winter on February 16, 2015 by Amy.